As part of yesterday’s column about global growth, poverty, and inequality, I realized that I’ve written several columns about economic policy in China, but never once focused on overall policy in India. Indeed, a quick look through the archives reveals only three columns that even addressed specific policies in India. And all of them were negative. The Indian government’s mistreatment of private schools. The Indian government’s war on cash. A member of the Bureaucrat Hall of Fame from India. So it’s time to assess overall economic policy in India, which means this is an opportunity to point out that there are some positive developments in the world’s second-most populous nation. One of my Cato colleagues, Swaminathan S. Anklesaria Aiyar, wrote an exhaustive study on India’s economy last year. The bottom line is that there’s been some progress, most of which took place in the 1990s. India’s economic reforms over 25 years have transformed it from a low-income country to a middle-income one. But to become a high-income country, India must liberalize the economy much further. At the risk of oversimplification, India has gone through three phases since its independence after World War II. It began with a long period of statism and socialism. Here are some additional excerpts from the study describing that grim period. And I’ve augmented those passages with India’s awful score from Economic Freedom of the World in 1975, when it only scored 4.33 on a 0-10 scale. …until 1990, India was…hamstrung by a million controls, imposed in the holy name of socialism and then used by politicians to create patronage networks and line their pockets. …The public sector was supposed to gain the commanding heights of the economy. Nothing could be manufactured without an industrial license or imported without an import license, and those licenses were scarce and difficult to get. Any producers who exceeded their licensed capacity faced possible imprisonment for the sin of violating the government’s sacred plan targets. …Indian socialism reached its zenith in the 1970s, when the banks and several major industries were nationalized. The top income tax rate rose to 97.75 percent, and the wealth tax to 3.5 percent. …India’s poverty ratio did not improve at all between independence in 1947 and 1983; it remained a bit under 60 percent. Meanwhile, the population virtually doubled, meaning the absolute number of poor people doubled. Now let’s look at some good news. 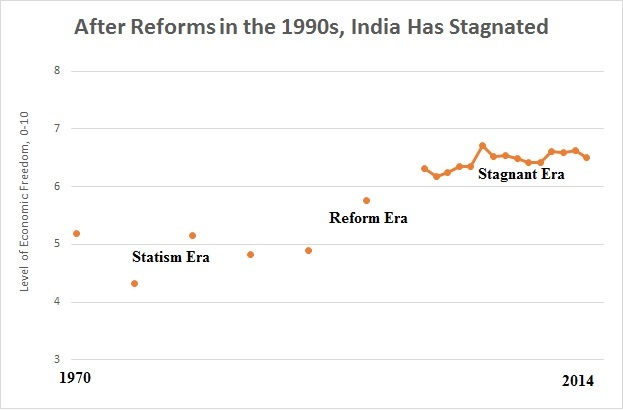 There was a small amount of reform in the 1980s, which became much more significant amount of reform in the 1990s. In 1991 India embarked on major reforms to liberalize its economy after three decades of socialism… P. V. Narasimha Rao became prime minister in 1991. The Soviet Union was collapsing at the time, proving that more socialism could not be the solution for India’s ills. Meanwhile, Deng Xiaoping had revolutionized China with market-friendly reforms. And so Indian politicians turned in the direction of the market too. …After 1991 direct tax rates gradually came down substantially… The wealth tax on shares was abolished, making it possible to raise shareholder value without being penalized for it. …The corporate tax was cut from a maximum of 58 percent to 30 percent, yet corporate tax collections increased from 1 percent of GDP to almost 6 percent at one point. …Personal income tax rates also fell from 50 percent to 30 percent, but once again collections rose, from 1 percent of GDP to almost 2 percent. Notice, by the way, that lower tax rates led to more tax receipts. Yet another piece of evidence for the Laffer Curve. Though I’m much more interested in whether people benefited, not whether politicians collected more money. And the paper reveals that the reform era generated significant dividends. There’s even been good news on poverty. Now let’s shift to bad news. Simply stated, India needs a lot more reform, but it doesn’t seem to be happening. 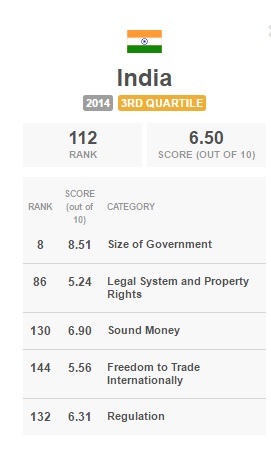 As illustrated by this chart showing the country’s annual scores from Economic Freedom of the World, India is mired in a modern era of policy stagnation. In other words, so much more is needed to help India become a rich nation. Yet the reform agenda has been spotty in the past two decades, or even nonexistent. Here are some final excerpts, accompanied by India’s most-recent EFW scores. Many old price and quantitative controls should be abolished, and yet more are being enacted. Extensive controls permeate the entire chain of agricultural inputs, outputs, and processed agricultural goods (notably sugar). New price controls have been clamped on seeds and even on royalties paid by seed companies to suppliers of technology. The tax regime is uncertain, and many cases of retrospective taxation have tarnished the investment climate. …Even as old controls have been liberalized, dozens of new regulations are issued every year relating to new areas like the environment, health and safety standards, forests, and tribal areas. As with the old controls, the new controls are issued in the name of the public good and are then used by politicians and inspectors to line their pockets. …The bureaucracy is notoriously corrupt and slow moving… Public-sector corporations remain large, wasteful, and unreformed. Government banks still control 70 percent of bank lending, have the worst record of bad loans and financial losses, and yet are such convenient cash cows for politicians that no party wants to privatize them. …To reach high-income status, India must become a much better governed country that opens markets much further. 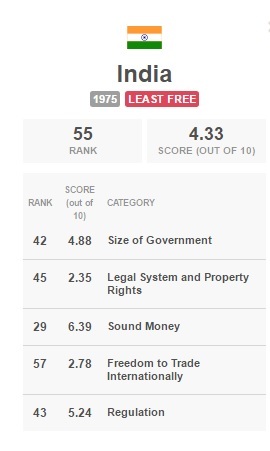 The good news, if you compare the 1975 and 2014 EFW scores, is that India now enjoys much more freedom than it did at the peak of the socialist era. That being said, there are 111 nations with more economic freedom, so there is a lot of room for improvement. Let’s close with a very powerful factoid. America has many immigrant populations that earn above-average incomes. But, by far, Indian-Americans are the most successful.